Santa Cruz, California - Ron Rockwell and independent iOS and Mac developer Marcus Roskosch have announced the release of Repair Database for iPhone, iPad and iPod touch. This App contains more than 100,000 repair solutions for everyday electronics like TV, CD-Player, PCs, Printers, Laptops and more. All that information has been collected by Certified Repair Technician Ron Rockwell and fellow technicians in the repair business and is now available for everyone on a small device like the iPhone, iPod touch and even iPad. As Ron provided his knowledge and content for the App, Marcus who won the prestigious EMMAs Award in 2010 with his iPhone APP for NXP Semiconductors developed the App. The biggest challenge was to find a fast and easy to use solution for this huge database, Marcus said. This database can be quickly searched by full-text or just by entering Make, Model or Type. All common and uncommon brands are included from A like ACER to Z like Zenith. This App is a must-have for anybody in the Tech industry and or people who like to do it themselves. The goal with this app was to unite the common tools needed to get the job done efficiently. 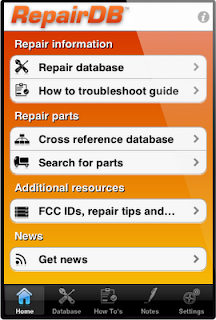 So in addition to the repair database, the App contains a cross reference database with over 28,000 parts for components along with a component search engine that so far finds even the discrete hard to find parts. Octopart, the well known search engine for electronic parts, has been fully integrated in the App. Octopart can be used to lookup almost any electronic part and to compare prices, datasheets and even directly order online. An FCC Database of over 6,000 FCC IDs and Companies with Addresses is also included. Last but not least, Ron continues to share his knowledge by providing step-by-step information on how to identify and fix common Laptop and PC issues. Best of all, this database is available offline so no internet is required. The content of this App will be updated frequently and automatically for free "over the air". Repair Database is the first and only of its kind on the App Store. There are some which provide just a fraction of what is included in Repair Database. $4.99 is a small investment for the magnitude of information available at your fingertips. Repair Database 1.00.01 is $4.99 USD (or equivalent amount in other currencies) and available worldwide exclusively through the App Store in the Reference category. creating-your-app.de was founded 2008 by Marcus Roskosch as Software development company for iOS and Mac Apps. Copyright (C) 2012 creating-your-app.de. All Rights Reserved. Apple, the Apple logo, iPhone, iPod and iPad are registered trademarks of Apple Inc. in the U.S. and/or other countries. This is a great news, this would be for the first time any technician might have think about such things. This database repair is definitely going to attract lots of users.